Developments Bunkerville Bundy Trial Nevada | RANGEfire! According to a hot-off-the-press story in The Arizona Republic, An investigation accusing a federal agent of misconduct and ethics violations could derail one of the most high-profile land-use trials in modern Western history. Already, they are filing motions to confirm it. A defense lawyer said Thursday they are asking a federal judge to force the government to reveal the name of the agent in the inspector general’s report. If it is Love, they will ask for charges to be dismissed against the Bundy Ranch defendants before the trials begin. BLM officials in Washington, D.C., declined to comment on the inspector general’s report and would not confirm if Love is the unnamed agent. BLM spokesman Michael Richardson called the report a personnel matter. He said the unnamed agent is still employed with the BLM, but Richardson said he would not discuss the agent’s status or current assignment. The U.S. Attorney’s Office in Las Vegas also declined comment. Spokeswoman Trisha Young said Friday the witness list in the Bundy Ranch trials has been sealed and is not open to the public, and she declined to speak about Love’s role in the case. The inspector general’s report could damage the credibility of the government’s case if Love is identified as the agent, said Sara Gordon, associate professor of law at the Boyd School of Law at the University of Nevada, Las Vegas. She said defense attorneys involved in the Bundy Ranch trials might not be able to show juries the inspector general’s report but could question Love about specific incidents raised in it. Gordon said any damage defense lawyers could inflict upon Love’s credibility would not affect the credibility of other witnesses testifying for the prosecution. Federal officials said the BLM agent’s name was withheld from the Burning Man report because he is not a top official within the agency. But an analysis by the Reno Gazette-Journal and The Arizona Republic found many details in the report coincide with Love’s career, including the agent’s former title, his base of operation, his past assignments and his on-site supervisor. In addition, the report cited a June 2015 Gazette-Journal story about complaints against Love over his conduct before Burning Man began. The Inspector General’s Office adopted language in its report identical to the Gazette-Journal article naming Love as a person behind a series of official requests that would have required Burning Man organizers to build a $1 million luxury compound for BLM officials at the event. Among Love’s requests were flushing toilets, laundry facilities and 24-hour access to ice cream, documents show. 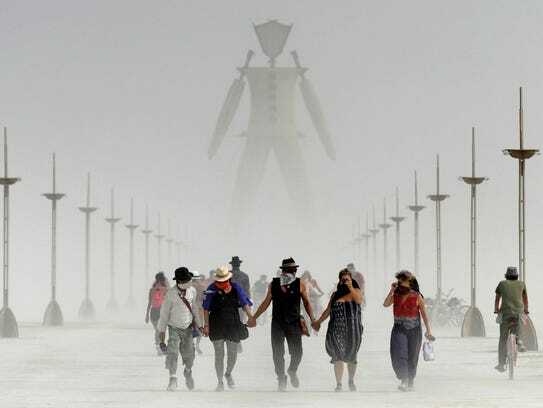 The inspector general’s report said the unnamed agent used his official position to buy three sold-out tickets to Burning Man; had five on-duty BLM officers escorting his father, family friend and girlfriend during the event; and also changed the hiring process so an unqualified applicant, a personal friend of his, would be hired. Investigators said when they began looking into the complaints, the agent called other employees and encouraged them not to cooperate. He told them “I don’t recall” was a valid answer to investigators’ questions, the report said. Love’s conduct was being called into question years before the Bundy Ranch standoff. Love, formerly with the Federal Air Marshal Service, became the BLM’s Nevada and Utah special agent in charge in 2012 and has often captured headlines for actions that exacerbated an already strained relationship between the federal agency and landowners. Utah Lt. Gov. Spencer Cox called for Love’s ouster from the state in 2014, saying the agent had so many conflicts with local officials that it was becoming a barrier to law enforcement, according to reports published in The Salt Lake Tribune. Cox said he and other state officials were unable to negotiate with Love, and he publicly told a state commission that he didn’t want Love “instigating a war,” according to The Tribune. Cox could not be reached for comment Friday. A spokeswoman for Utah Gov. Gary Herbert confirmed the statements made by Cox in 2014 and said they accurately reflected the state’s position. Love maintained he had the federal courts on his side and wanted to end the standoff peacefully. Then he told Santilli that the protesters didn’t have enough people to hold off law enforcement, saying, “You better hope that 10,000 show up,” according to one website. Bundy’s fight with the federal government dates back to the early 1990s, when he refused to pay the BLM for allowing his cattle to graze on public lands near his ranch in Bunkerville, Nev., about 80 miles north of Las Vegas on Interstate 15. 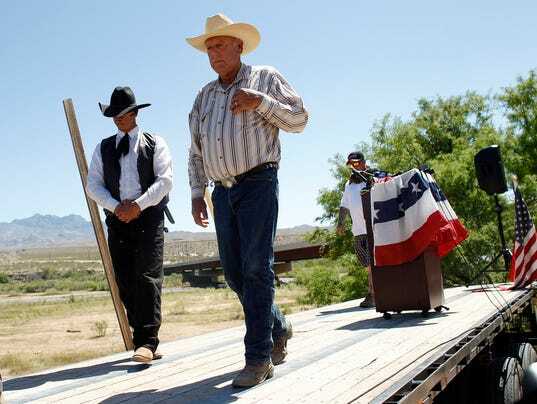 For two decades, the BLM repeatedly ordered Bundy to remove his cattle from federal lands and in 2014 the agency obtained a court order to seize Bundy’s cattle as payment for more than $1 million in back fees. 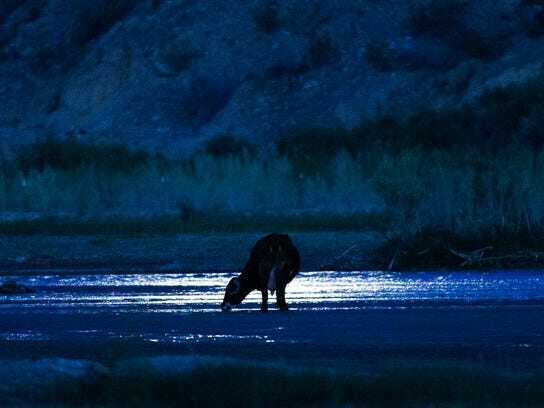 In April, the BLM, led by Love, implemented a roundup of 1,000 head of Bundy’s cattle ranging on public land. The standoff was hailed as a victory by militia members. Cliven Bundy’s sons, Ammon and Ryan Bundy, cited their success at Bundy Ranch in their run-up to the siege of an Oregon wildlife refuge in 2016, also in protest of BLM policies. They said they could make the federal government stand down. Cliven Bundy’s attorney said Thursday it “will be very interesting” to see how the case plays out with Dan Love as the government’s key witness. And yet the BLM keeps promoting this sorry SOB. Absolutely no accountability. What’s it going to take to get rid of Dan Love? He’s such a plague. Is it true the grazing alottment $$$ BLM claims are not paid by Cliven Bundy are actually sitting in a trust account; and there must be 2 signers for the funds to be released to BLM, but the named BLM official who is to sign won’t do it? The other cosigner is Cliven Bundy, who did sign. As long as the BLM does not sign off, it can claim the fees are not paid. A few months back, when North Dakota Law Enforcement began their militarized approach to Peaceful Resistance against the Dakota Access Pipeline being routed 1/2 mile from the Standing Rock Reservation water source, a ‘stranger’ appeared in the midst of the newly outfitted riot police lineup. He was everywhere directing focus on certain individuals as ‘leaders’ to be arrested and removed from the group. There were a few images of him working in the LE ranks. He was without a badge, but dressed in full riot gear including body armor. A few images of him came through without his face shield. I’m pretty sure it was Dan P. Love. Some of the biggest earth- shaking events that happened in Nevada were also felt in Oregon, Utah, and other states if you know what I mean! I don’t feel Cliven Bundy owes the BLM anything! They have burned up his cattle they have harassed his family and himself and other Ranchers. The BLM have been the terrorist.I watch the video of the BLM in helicopters chasing the poor cattle who can’t defend themselves. seeing how many they burned the hide off ! Who ordered that the mass graves of cattle! One rancher murdered who went to help other ranchers. and many men in Prison for Helping Ranchers!! !Come on smell the roses ! Love is mentally sick! But he’s not the only one I could see the ranks of the BLM making him the fall guy! Also the government involvements it go on and on Bigger than life its self for greed for power for control of the people and well you know the rest! Cliven Bundy raised his family in the light of God ! with morals,with love thy neighbor,knowing right from wrong To Know The Constitution! It should go up the power grid anyone involved in this case and the Oregon stand off with ill intent should be held accountable! A man was murdered ! Anyone that fired their weapon at either stand off should be held accountable. I am a american citizen sitting in my living room with friends and family following this story from the start.. Also researching ! I’m not the only one I have met so many people on this journey to see whats going on here ! Germany, Australia, England and it goes on ! Concerned people from around the world are watching ! When Mr. Trump became The President Of The United States. A Constitutional President . The roof came off my house with everyone yelling ,praising God ! He said he would control our boarders, and care for our veterans! To help We The People with in our United States.Take Care Of Our Own.We know he has a lot on his plate but we feel he should delegate and over see this earth shaking events in Nevada,Oregon, and especially the death of Mr. Finicum. Please Help Mr. President restore our Constitution.